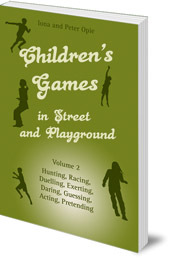 A magnificent survey of over 85 games played by children, largely out of sight of adults, in the 1960s, in the street, playground and wasteland. Perhaps this book should come with a warning to parents: within these pages, children deliberately scare each other, ritually hurt each other, take foolish risks, promote fights, and play ten against one. And yet throughout, they consistently observe their own sense of fair play. This was Iona and Peter Opie's pertinent observation in 1969, and it was this gap that they sought to fill with their exhaustive survey, through the 1960s, of the games that children 'in fact play' aged roughly between six and twelve years of age, and when outdoors -- and usually out of sight. The Opies weren't interested in formal games and sports supervised by parents or teachers. What excited them were the rough-and-tumble games for which, as one child described, 'nothing is needed but the players themselves.' They were also anxious that, in their meticulous recording of the games, the spirit of the play, the zest, variety and disorderliness, should not be lost. The result was their classic work Children's Games in Street and Playground. To aid a clear and lively presentation of their remarkable study, the original single book has been divided into two. Both volumes record games played in the street, park, playground and wasteland of more than 10,000 children from the Shetland Isles to the Channel Islands, although the majority of the information comes from children living in big cities such as London, Liverpool, Bristol and Glasgow. 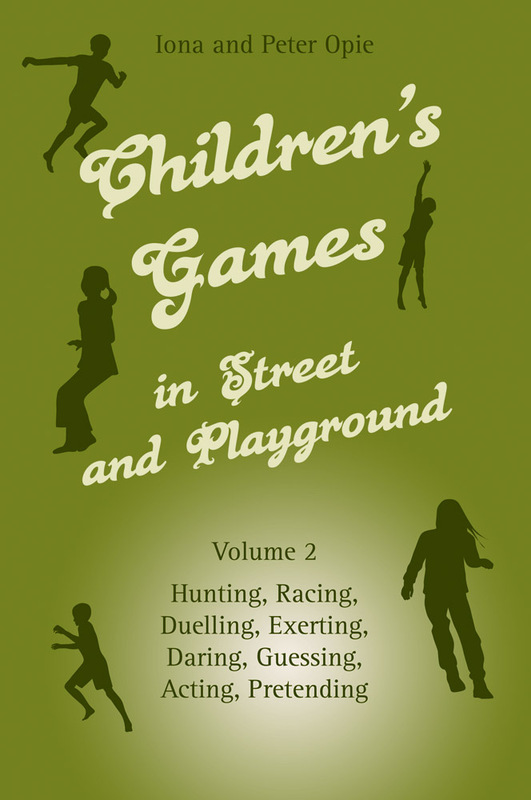 This second volume focuses on games involving seeking, hunting, racing, duelling, exerting, daring, guessing, acting and pretending. More than 85 games are described in detail including the rhymes and saying children repeat while playing them, together with the different names under which they are played. Brief historical notes are also included where relevant. The children of the 1960s, the Opies noted, are often thought 'to be incapable of self-organization, and to have become addicted to spectator amusements.' to the extent that adults must be relied on to provide play materials, ideas and time to play with them. The same attitudes are still widespread today with our concerns about television and computer games, and the middle-class parental impulse to fill our children's days with organised classes and play dates. 'However much children may need looking after, they are also people going about their own business within their own society.' There are important lessons to be learned from this book about giving children the time and physical space to be themselves with other children. JACK, JACK, SHINE A LIGHT. WILL O' THE WISP. EGGS, BACON, MARMALADE, AND BREAD. TRUTH, DARE, PROMISE, OR OPINION. FILM STARS. I SENT MY SON JOHN. SHOP WINDOWS. ANYTHING UNDER THE SUN. BIRDS, BEASTS, FISHES, OR FLOWERS. FOOL, FOOL, COME TO SCHOOL. JAMS. OLD MAN IN THE WELL. MOTHER, THE CAKE IS BURNING. Iona Archibald Opie was born in 1923. During the Second World War, she met and married Peter Opie. Together they became a renowned husband-and-wife team of folklorists with a particular interest in children's toys, games and literature, working from their home in Hampshire and conducting primary fieldwork all over the United Kingdom. Their remarkable collection of children's books and ephemera was purchased by the Bodleian Library in Oxford in 1988. They were the authors of over 30 books including The Oxford Dictionary of Nursery Rhymes (1952) and The Lore and Language of Schoolchildren (1959). Iona Opie lives in Hampshire. Peter Mason Opie (1918-1982) was a specialist in children's literature. He met and married Iona Archibold during the Second World War, and together they became a renowned husband-and-wife team of folklorists with a particular interest in children's toys, games and literature, working from their home in Hampshire and conducting primary fieldwork all over the United Kingdom. Their remarkable collection of children's books and ephemera was purchased by the Bodleian Library in Oxford in 1988. They were the authors of over 30 books including The Oxford Dictionary of Nursery Rhymes (1952) and The Lore and Language of Schoolchildren (1959).